Epoxy Resin - 2000/2100F by Resin Research. For all marine applications. 2000CE ultra II Epoxy Resin and Hardener by Resin Research. The ultimate Epoxy Resin. UV stable, clear (very clear) safe, bright, white, quick, strong and easy to use, this is by far the best epoxy resin available today. Easy 2:1 mix ratio for trouble free use. Ultra clear laminates when used with the optically matched Hexcel by Seabase fibreglass. This product includes resin and a choice of hardeners. Choose from options. More below…. 2000CE ultra Epoxy Resin by Resin Research. The ultimate Epoxy Resin. UV stable, clear (very clear) safe, quick, strong and easy to use, this is by far the best epoxy resin available today. Easy 2:1 mix ratio for trouble free use. Ultra clear laminates when used with the optically matched Hexcel by Seabase fibreglass. 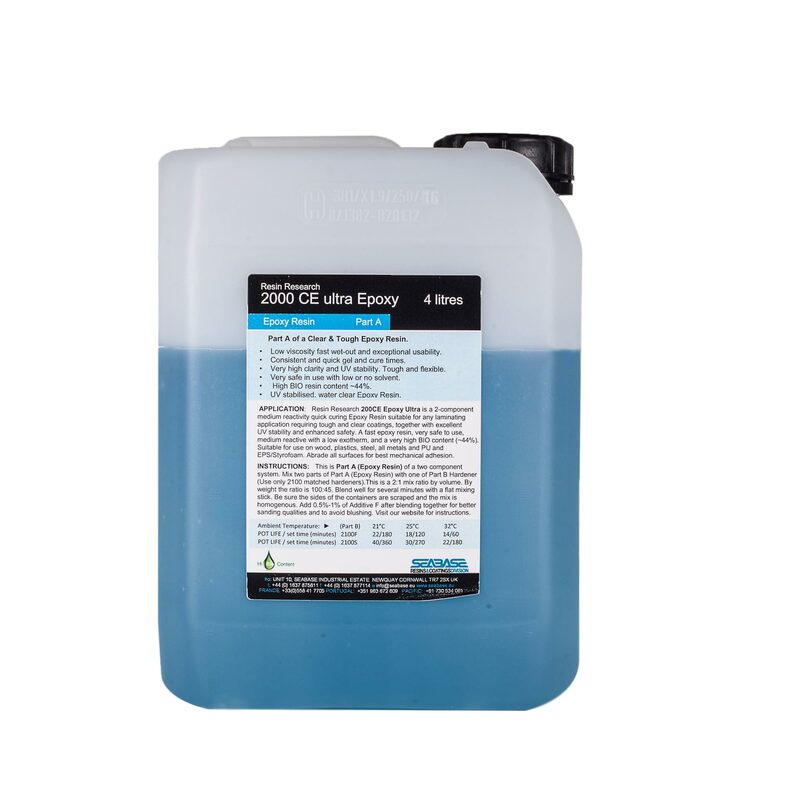 Use the Epoxy Mix Ratio Sheet for accurate weight & volume mixing. Note: We sell in litres. 1 litre of Resin Research Epoxy is approximately 10% more than 1 kg of resin. The balance of excellent colour, UV stability, variable hardener speeds, easy mix ratios, extremely low vapour pressure, excellent chemical adhesion and high gloss finish make this resin system easy to use and an effective production contributor to everyone from the small craftsman to large scale producers. Has a high BIO content. Use in multiple applications – from small repair jobs, fixing stantions, plugs and boxes, laminating walls, surfaces, kitchen tops, work tops, floors, boat building, all marine applications – a myriad of uses in all scenarios. Cures hard yet flexible – not brittle, and stays white for longer with its unique UV stable qualities. Safe to use – few users suffer sensitization. 2000CE Ultra II contains optical brighteners for high visual impact. Note: This pack has either the fast hardener 2100F or the slower hardener 2100S. The fast 2100F hardener is suitable for most applications, including fitting boxes, plugs, stantions and posts. If the area is very deep or requires more than 1″ (25 mm) of resin in a block, use the slower hardeners to avoid thermal shock. 2100F has a low exotherm, but 2100S has a much slower time scale to peak exotherm. For extra slow gel and cure, avoiding any thermal or pattern distortion, use 2100X hardener. The use of slower hardeners slows production time and may cause incompatibility or delamination problems if using a fast curing hardener over the top. Do not mix hardeners or use 2100F hardeners in Kwik Kick resin. They are not compatible. (there is a new resin arriving soon that is dual use). For an even faster gel and cure time use Kwik Kick ultra Epoxy with Kwik Kick hardener. Call us (+44 1637 875811), e-mail sales@seabase.eu or note on your order and we’ll customise your mix for you. Has your Epoxy thickened or gone cloudy? See why here….. The full instructions and gel and cure times are here and the Mix Ratio sheet by volume and weight.